Great Leadership: Help Wanted: Great Leader. No Technical Experience Needed? Help Wanted: Great Leader. No Technical Experience Needed? B: Someone with tons of experience and skill in your work, but with only so-so leadership skills? Ah, you say, it’s a trick question. The right answer is C: both, right? Well sure, the ideal manager, or even CEO, brings the complete package to the table: functional, industry, leadership skills, diversity, and nice hair. However, we all know that those perfect candidates are hard to find and rarely exist. 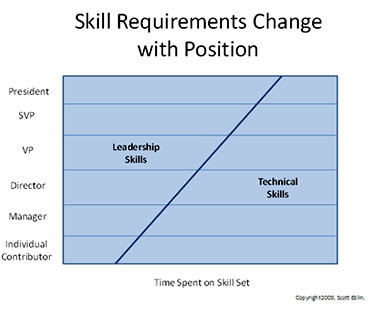 The “leadership vs. technical” skills debate is not a new one, but it’s been in the news a lot lately. The issue was raised during the recent U.S. presidential elections, both with Barack Obama and Sarah Palin. Leon Panetta and Sanjay Gupta are two more names that have been criticized for a lack of technical experience. Donna Bear from i4cp, just wrote an interesting article on the debate in this month’s i4cp Trendwatcher. She points to two recent examples (Microsoft and LinkedIn) of CEOs who appointed HR executives with no HR experience. “Why is it deemed perfectly acceptable to place someone with no related experience in HR but not in other functions? Does it reinforce a perception that "HR" equals "people-related" and, therefore, any executive should be able to handle it? Or does it prove that HR is an ideal training ground for executive talent?Some may feel that the idea of placing a generalist executive in HR is a dismissive statement about the necessity or value of HR expertise. Why not place a charismatic, trustworthy, intelligent thinker with no financial experience in a CFO position? Would a proven leader with these attributes but no direct manufacturing experience be a viable candidate for the VP of manufacturing? Those with this viewpoint might hold that this is just another slam to the HR profession: "Come head up HR ... no experience necessary." Well, actually, yes, I’ve seen lot’s of examples of successful manufacturing, marketing, engineering, and HR executives with little or no technical experience (I admit, though, I’ve never heard of a successful CFO with no finance background). Scott’s model makes a lot of sense. He’s also had a lot of first hand experience in coaching executives that are struggling, and it’s rarely a lack of technical skills that get them it trouble. I’m sure we can all think of exceptions to this rule. I’ve already mentioned finance. HR colleagues in the motion picture industry have told me that it is so heavily dependant on relationships that it’s difficult to be successful without industry experience. I’m sure there’s many more. The problem is, while we all may agree that in higher level positions, leadership outweighs technical, we all think our situation is the exception. I see it all the time in the succession planning work I do, as I often run into resistance in trying to broker cross-functional development moves. I know where I stand, and it’s based on one of my worst management mistakes ever. Years ago, I was hiring a trainer. I had two strong candidates. Candidate A had years or experience at different companies, a master’s degree, and all the right technical qualifications. There was something about her that didn’t sit well with me, and there was a report of her losing her temper and swearing at a trainee recently. Candidate B was likable, respected by everyone, had chemistry with my team, and seemed to have unlimited potential. She only has an associate’s degree with little technical experience. You can guess how this story ended – I made the wrong choice and hired A. She ended up swearing at me, and my manager, and finally quit before I could fire her. B went on to become a department head. How about you: who would you rather have as a manager or leading your organization: the great leader or the technical expert? In those HR departments with novice HR leaders, there is no doubt to me that s/he has SMEs doing the actual work. If faced with a choice that left me unsettled, I would keep looking. I would choose the one with the best leadership skills! You can't give a definite answer for a general question. I'd always go for an option which seems better in a particular situation. There's a pool of people who are already in the team. Do they lack leadership or technical expertise more? Personally I was in in both situations. I remember the case when I needed someone with technical expertise so much I was ready to cover candidate's lack of leadership getting involved in a project myself (and taking additional responsibilites). I can recall situation when as far as one was willing to learn I could give her enough time to catch up with tehnical knowledge, but I expected to see a good candidate for leader from the very first day of her work. One more observation from my recruitment adventures - I think it's much harder to find a great leader than a great technical expert. That's why statistically I'd probably choose A option more often. Great post Dan, and I think you raise some really fantastic points. I personally will always hire the great leader, with my one provision being that his/her supporting cast have phenomenal technical skills. If the blocking and tackling can't be accomplished proficiently, even the best leader will suffer.